You may have noticed more RV parks popping up or more ​RVing resources coming on board within the last few years. This is because RVing has become more popular over the past couple decades. More families are investing in an RV and the fun than it brings than ever before and the popularity is bridging over into popular culture, including television. There are several RV related shows popping up on different networks to further fuel the RV popularity and we think that’s pretty great. Let’s spotlight one of those shows on the Travel Channel, known as Big Time RV. We'll look into the format of the show, what it brings to the table and of course when you can catch it. If you aren’t out on an RV adventure, you can use Big Time RV to please your need for RVing right in the comfort of your living room. What is Big Time RV All About? Big Time RV is a reality show airing on the Travel Channel. The show is based around the going-ons and dealings of a major RV dealership located in Tampa, Florida who bill themselves as America’s largest and more prestigious RV dealer and that’s not hyperbole as this RV dealership is the largest lot in the United States. The camera crews to document what life is like at this upscale and major dealer including following the sales force around with new and returning customers as well as documenting the service center which seeks to keep these upscale models in pristine conditions. This particular dealership stands out among other RV dealers from their dealings with high-end models and high-end clientele. You won’t see salesman running around seeking to flip over a used fifth wheel for a few thousand dollars, rather this dealership is dealing with top-of-the-line RVs like diesel pushers and other Class A motorhomes. Of course, just like watching a show on high-end homes, you do get to see some of the luxurious amenities and features offered by some of these high-end motorhomes as well as see what some of these bad boys can do on the road. Like most reality shows, this one is based on the wild, eccentric and entertaining. Think big personalities, big style, big RVs and big presentation. 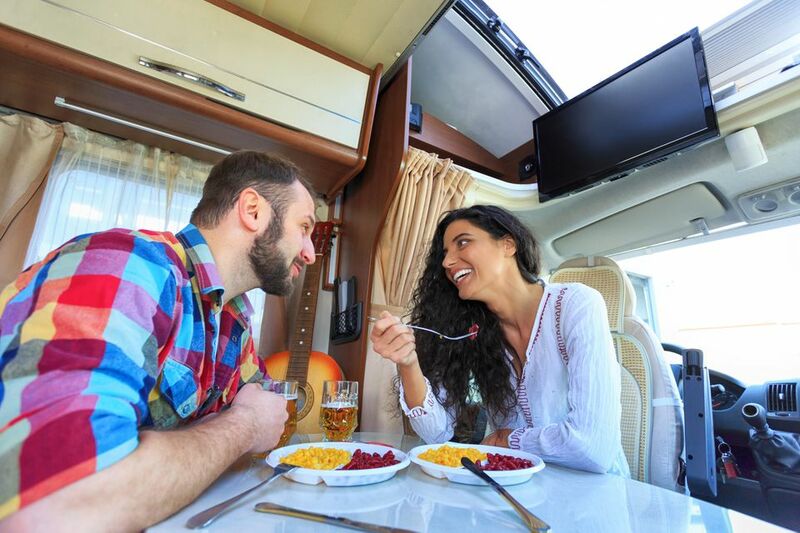 Many RVers out there may not be able to afford some of these big-time models but sure is fun to see their inner workings, amenities, and other features. While some of these RVs might be out of the price range of the average RVer, you can dream, right? What RV Dealership Is It? The RV dealership featured on Big Time RV is actually Lazy Days RV found in Tampa, Florida. For the show, they specialize in the biggest and worst of RVs but in reality, they are a full-service dealership that deals in everything from the Class A diesel pushers to fifth wheel trailers to your everyday pop up camper. Lazy Days also runs an RV service and maintenance shop on its premises where they can take care of everything from routine maintenance to upgrades and renovations. Like the lot, the service center is huge and hosts 220 individual repair and service bays in their Tampa location that is featured on Big Time RV. On top of their sales lot and service center, Lazy Days also hosts their own RV resort with 300 individual sites. So if you want to buy an RV, have it upgraded, then test it out, that is all available at one stop at Lazy Days RV. So if you can’t get enough RVing we recommend tuning into Travel Channel for some fun with Big Time RV. Want to see some of the biggest, baddest RVs in the country? Tune in to Big Time RV which currently airs on the Travel Channel to see RVers come face-to-face with the RV of their dreams. Would You RV in a Treehouse?